What Makes a 'Supermoon' So Super? The full moon of March 2011, as it appeared to skywatcher Dmtriy S. Benbau in Ekaterinburg, Russia in the early-morning hours of March 19. Much ado has been made about the so-called "supermoon" that will take place tonight (March 19). Tonight's full moon will nearly coincide with the moon's arrival at the perigee point in its orbit around the Earth, resulting in the closest and biggest full moon in our sky since March 1993. On Saturday night, the moon will arrive at perigee at 19:09 UT (3:09 p.m. Eastern Time). Its distance from the Earth at that moment will be 221,565 miles. But just over three years ago, on Dec. 12, 2008, which was also the night of a full moon, the moon reached perigee at 21:39 UT (4:39 p.m. Eastern Time) at a distance of 221,559 miles, about 6 miles closer than Saturday night's perigee distance. So it seems Saturday night's supermoon will actually be just a little less super than the full moon of Dec. 2008. Chester points out that on Dec. 12, 2008, the moon reached fullness at 16:37 UT, while perigee was at 21:39. That's a difference of just over five hours. So when the moon turned full that night, it was still five hours away from reaching its closest point to Earth; its distance at the moment it turned full was 221,587 miles. So even though the moon actually came a little closer to Earth in December 2008, if we compare distances when the moon officially turns full, today's full moon wins out by a scant 21 miles. But for North Americans ... second place! In all fairness, we should also point out that on Dec.12, 2008, the moment that the moon officially turned full was not visible in North America because it occurred during the daytime, when the moon was below the horizon. 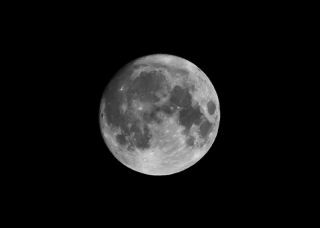 So back on Dec. 12, 2008 — as will be the case tonight — when millions of people cast their gaze toward the moon, it really wasn’t a "full" moon, but rather a waning gibbous moon. The same case will hold true tonight. Certainly, to all of us who look up at it tonight's moon, it will appear "full," but keep in mind that the actual moment when the moon's disk became 100 percent illuminated will have already passed many hours earlier. Although not readily perceptible to most eyes, tonight’s moon will be waning or diminishing in illumination. Rather than seeing it fully illuminated, tonight we will see it at about 99.8 percent illumination). In addition, the moon that North Americans will see with their own eyes tonight will actually run a very close second to that of Dec. 12, 2008, in terms of distance. But on Dec. 12, 2008, at moonrise, Bostonians saw the moon ever-so-slightly closer, at 221,559 miles; again, just a scant 21 mile difference. That's because in 2008, the moon took more than five hours to reach its perigee point after it turned full. The moon was arriving at the closest point in its orbit just as darkness had begun to fall and the moon was beginning to appear over North America. As Geoff Chester has already pointed out above, today's full moon and moment of perigee occur within less than an hour of each other, during the late morning/early afternoon hours for North America. By the time darkness is falling and the moon begins appearing over the eastern horizon for North Americans, it will have already been slowly receding from Earth and so it will be a little farther away than it was in 2008. But don't let all this stop you from going out tonight and enjoying the sight of this, the "biggest moon of 2011." The moon is, after all, our nearest neighbor in space, Earth's eternal companion and friend. And let's face it ... what's 21 miles among friends?